For this year’s #TunneyWeek we’d love to organize a special Birthday present for Robin. 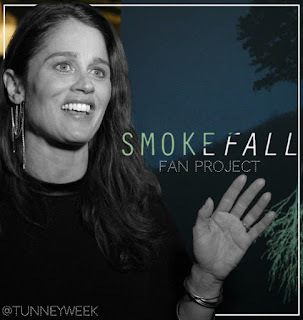 We’d like to put together reviews and thoughts of the people who were able to go and see Robin in “Smokefall” last February and March in NYC. Send an email to tunneyweek1@gmail.com with your reviews and thoughts on the play. What you write should be no longer than one page (you can take as example a Word page). If you also have a photo with Robin taken before or after the play, and you don’t mind sharing it, you can send it attached to your email. The deadline to send us your part is June 12. We will put together all your thoughts in one document and we will tweet it to Robin as a Birthday present! We think she would appreciate reading your thoughts on a project that meant so much to her. If you have any question don’t hesitate to contact us via our socials (email, here, or @TunneyWeek on Twitter)! To all of those who couldn’t go see Robin in Smokefall, no worries, we have something in mind for you as well. We will all be able to participate and make something for Robin’s Birthday! Stay tuned for more details to come during the #TunneyWeek!